Surprisingly this is the first spec home I’ve designed. Typically I work with clients on their own homes so it was a somewhat different experience creating a design for someone I had never met and predicting what they would want. I have worked with the builder previously on his personal home and this was to be much the same style; a home for empty nesters with lots of room for entertaining and space for visitors. It had to have style and big features. We achieved just that ! Although the site is not terribly complex, it does drop off sharply about the middle of the living area towards the northeast lot corner. There really is no flat area except the driveway and a portion of the front yard. Curb appeal was most important on this home and a large entrance porch with oversized timbers and a truss were used to draw you to the entry. Although the house appears to be a relatively simple ranch style from the street, the rear is much different. The left side is quite simple with no windows as it backs onto the neighbouring house. Privacy for both the existing home and this home were critical. The rear of the home is perched on the edge of a steep hillside with unobstructed views. The large triangular windows are located in the vaulted kitchen and the covered deck is accessed of both the living room and dining areas. The right elevation shows the steep grade to the rear of the site. 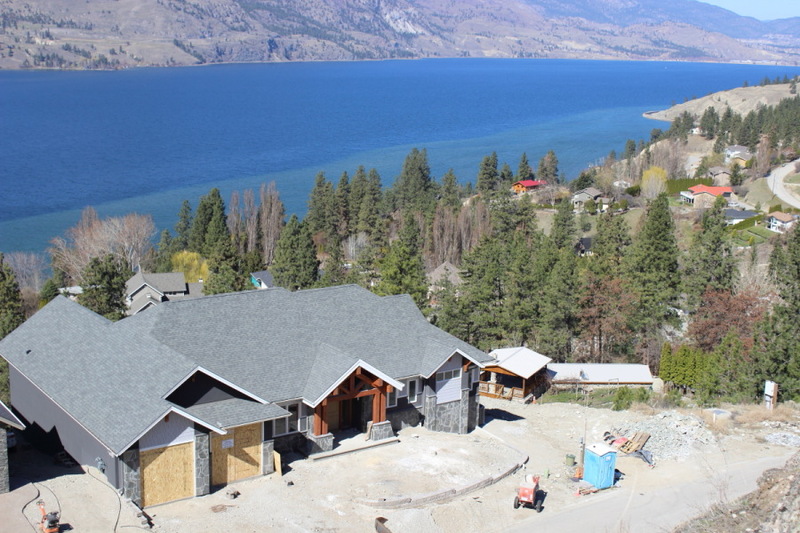 Due to the steep grade, no rear yard was provided so all of the outdoor living space is located on two large decks; one each on the lower and main levels. The main level is truly designed for just two people with lots of room to roam. 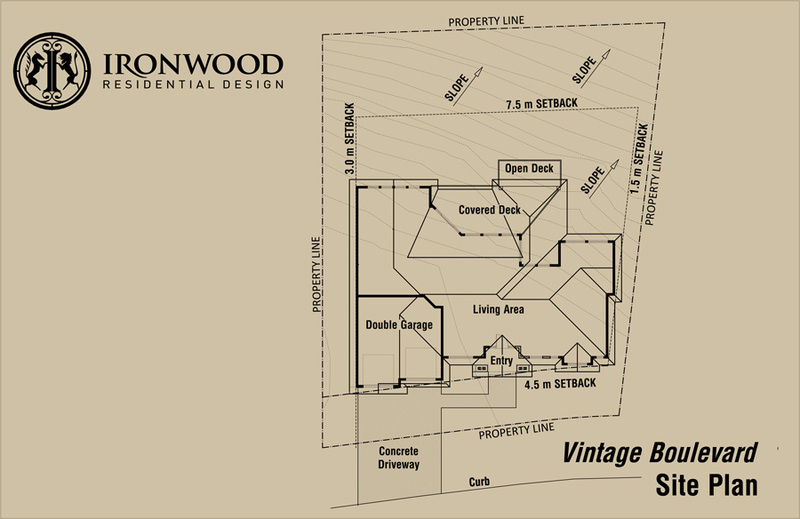 It has all the features of your typical home but in a well thought out, 2413 sq.ft package. An office is also included close to the entry for a home based business. The main level deck was situated for privacy with the kitchen hiding it from the neighbouring property. I’m in awe of the lower level of the house and how it turned out. It’s got absolutely everything you could need for entertaining along with two private bedrooms. One bedroom has an ensuite and the other is still private but shared with the living space. The first pour of the foundation is complete and backfilled for the basement slab. The house perched right on the edge of a slope but still had some flat area to work with. It’s really a spectacular view property. April 2012 Rebar is left exposed for the next pour which will be the 9 foot basement walls. All plumbing and drainage is in place, ready for the basement slab. This gives the clearest picture of the site conditions and complexity of the foundation. I have to credit the framer for doing amazing work and making this look easy. Deck piers still have to be located which are shown in later photos. Closer view of the footings poured on rock. Rebar dowels are drilled into the rock all around the perimeter of the building to ensure it doesn’t slide off the rock. At least it’s got great bearing ! You can see the water stain on the bottom left of the footing; these are weep holes placed to allow any water entering below slab level to make it’s way out rather than building up and freezing. Foundation viewed from the road above. Foundation grade is prepped for the lot on the right and of course the house to the left is complete so there was some thinking put into determining the ideal main floor level for this home. Here we are in June 2012 and the basement level walls are poured, stripped and framing has begun. Basement slab is now poured and rear wall framing has started. Check out how the grade drops off at the bottom right of the photo. I’m standing down the hill from the basement slab level looking up at the deck piers and of course, the hard working framers. This photo always has me in awe of the framer and how he managed to locate all the deck piers in just the right spot. It’s tough to picture now but once the deck goes on, it will all makes sense. Almost all the roof sheathing is complete except for the center portion at the vaulted entry. Once the timber beams are installed, then the roof joists and sheathing can finished. This is the ensuite (front yard facing) and master bedroom (bumped out wall) end of the house. The narrow horizontal window facing the street is raised above the others in order to place the ensuite mirror below it. It’s a great feature and can more easily understood with a view from the inside once it’s complete. Here’s the view from the head of the dining table. If you can believe it, this is the kitchen and the entire wall will be filled with windows. My mind said, why not create a different feeling kitchen with more of a great room feel to it. No cabinetry will be placed against this window wall. View south down the lake towards Okanagan Falls and Kaleden across the lake. Earlier on at the foundation stage it was harder to visualize what was happening here but now it makes more sense. A feature that I pushed for which was a little “off the wall” was the angled part of the deck. Typically the deck would have just run back into the house but I wanted to create a two storey window wall in this area. Unless you’re standing there it’s tough to grasp but it really is one of the most intriguing features of the home. Same shot as the previous photo about 3 months later. All the exterior finishes are complete and work has begun on the interior. Dec 2012 Here I am way down the hill getting some perspective on the nearly finished product. Its times like these where my mind can’t help itself but to start running all the way back to the beginning when this was just a bar lot and we had some rough ideas on paper. It’s really a great feeling to get to this point. Custom cut stone being applied to the front porch pier bases The front is almost complete and of course the timber truss is now installed. I went big with the beams here…..really big. Amazingly we had a mild enough start to the winter that this stone was just able to be completed in early December 2012. Sloping lot ? No problem !! April 2013 and landscaping the front yard has just begun. I’m so glad there is easy access to view the house from above because it really gives a much different perspective than from the street. Two of my designs side by side ! Finally here we can see the window wall in the kitchen. It’s exactly as I envisioned; being able to jut wander over to the window and have a peek at the lake. Looking back from the island toward the dining space. The fireplace is double sided and serves both the living area, dining and is still visible from the kitchen. Check out the shade on the deck. Perfect even on a sunny day ! Standing at the master bedroom door looking back towards the living room, you can also see down into the basement space below. Glass railings will be installed to keep it feeling open throughout. Here’s a feature I really like and have done before which is a window above the bathroom vanity. It’s more work and you can see mirror will have to be cut for the light fixtures but it lets in so much light and isn’t something you see all the time. I think I’d do it everywhere if I could. 10 foot ceilings help and it would be much tighter (but still possible) with a 9ft ceiling. The tub deck is to the left and the toilet room is on the right. I’m standing on the tub deck getting this photo of the walk-in shower. Notice the transom window above the door….another nice feature of 10 foot ceilings. More photos to come once the interior is complete.